Twenty years ago, when I first came to pastor Tenth Church in Vancouver, I was intimidated. I felt nervous about the challenge of pastoring a historic church that had dwindled from more than one thousand to a little more than one hundred members. The congregation was elderly and primarily of European ancestry, and the church had cycled through twenty pastors (including associates) over the past twenty years. On one of my first days at the church, the secretary told me, “Ken, I just want you to know that if this ‘ship’ sinks now, everyone will blame you since you were the last captain at the helm.” She was trying to motivate me to work harder, but her words depressed me! During those days, I felt constantly anxious, trying to keep the ship of the church afloat. I wasn’t doing this for the glory of God but to avoid humiliating failure. I didn’t want to be seen as a loser. Today, that panicky anxiety is gone, in part because our church is no longer edging downriver toward a massive waterfall. But more than that, I now feel at peace because I know that whether I ultimately succeed or fail, God is with me. My peace has been nurtured by certain spiritual practices which remind me, regardless of my performance, that I am deeply loved by the one who matters most. God’s love not only liberates me from unnecessary burdens, but it also energizes and inspires me for the work I do. I wish I could say as I write Survival Guide for the Soul that I’ve fully overcome my drivenness to achieve. But, as I look deep into my heart, I know that even though I want to be faithful, I also want to be successful. Though I want to love God, I also want to be liked and respected by people. Though I want to be loyal to Jesus, I’m afraid of being average, mediocre, or ordinary. I’m anxious about whether I am accomplishing enough, whether I am enough. Because all of this is an ongoing struggle for me, this book is, first and foremost, a letter to myself. In the chapters of my book I unpack the spiritual practices that help me experience God as someone who is alive and real in my everyday life. As I have grown more conscious of God’s loving presence, I have found I have a more robust, healthy identity and an enlarged capacity to make a meaningful, lasting difference in the lives of other people. I’m finding there is a life of unexpected vibrancy and depth when I live with Christ at the center of my daily life. This letter to myself is a survival guide of sorts. It’s a guide to surviving the damaging effects of a driven life, a way of overcoming the need to succeed by living satisfied in the acceptance and love of God. It’s a survival guide for the soul. — Ken Shigematsu, Survival Guide for the Soul: How to Flourish Spiritually in a World that Pressures Us to Achieve. 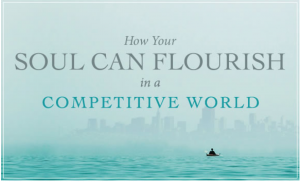 Learn how to live with joyful freedom in a competitive, performance-driven world. This book is also an excellent choice for small groups if people in your church, like so many of us today, are tempted to earn their worth through achievement. Several questions for reflection and discussion are included in each chapter.